Camier: "Aragon is kind of a home race for me"
After positive results in both Australia and Thailand, the Red Bull Honda World Superbike Team will hope to replicate their eastern form at the start of the European season, with the Honda CBR1000RR responding well in the four races so far. 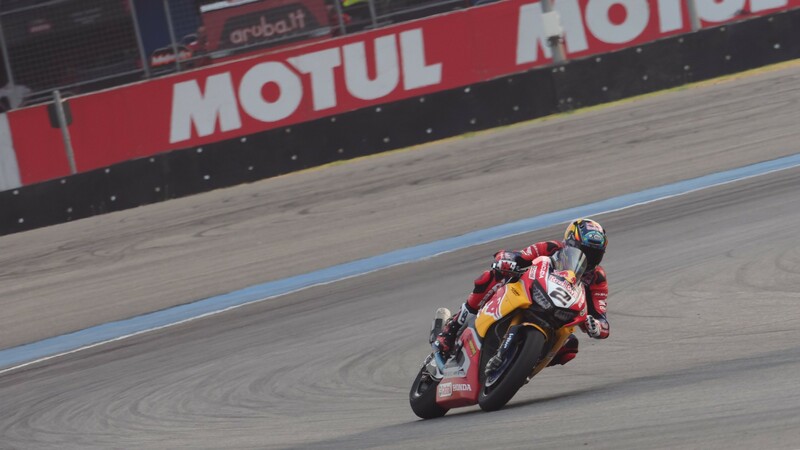 Sitting at 42 points and just 27 off the lead, Leon Camier (Red Bull Honda World Superbike Team) has performed his best start to a WorldSBK season. At the Thai Round he made his first two front-row starts for Honda, and came out of the weekend with an admirable fourth and sixth place. Camier has a long history in Aragon, with a 2011 third place in Race 1 his best result. The rider from Kent is positive going into MotorLand Aragon: “Aragon is kind of a home race for me given that I live in Andorra and I'm happy to be racing again in Europe. After the last round in Thailand we had a positive test at Assen as we continue to try and refine our package even more and step by step we're making progress. Although Aragon is a circuit I like, I haven't had the best results there over the past few years so I'm hoping to be more competitive this weekend with the Fireblade”. Continuing his first full season in WorldSBK, Jake Gagne (Red Bull Honda World Superbike Team) makes his WorldSBK MotorLand Aragon debut this weekend, although he has ridden here in other competitions. Only his second European race for a WorldSBK team, the American will hope to keep gaining experience while he closes the gap with his teammate. Gagne is excited for the race: “I'm really looking forward to getting back to Europe and getting back in to the swing of things. Luckily, I've ridden the Aragon circuit many years ago so unlike the first two rounds it is nice to come to a circuit where I know the layout which will help me get up to speed quicker. We had a tough time last time out in Thailand, but me and the team still learned a lot and so it will be good to get out there and make another step forward”. Find out how the Red Bull Honda World Superbike Team duo fare at the Aragon Round from April 13th- 15th, live through WorldSBK VideoPass.